Taken as a community, Indigenous Australians have also committed similar atrocities. Magistrate Pat O’Shane – of the Indigenous community for example unlawfully ordered me to go to prison for one year . The alleged offence was Trespass. I had the lawful right to be at the University of NSW. But the Indigenous lady sent me to prison – not caring about my rights as an Australian and the disability as a current migrant. In prison, other female prisoners – Indigenous as well as Non-Indigenous, shared their experiences with me. None of the Indigenous Australian prisoners complained of discrimination. Hence I do not identify with the above report. Taken as a community – perpetrators dilute the victims’ entitlements. I find the report unreliable – due to lack of commonness felt with the prisoners. Dr Kriti Sharma, is an outsider to the Australian system. I lived and worked as an Australian and endured pain as an Australian worker, to have the subjective connection and the authority to criticize my seniors in the Australian system. Outsiders have no right to publish outcomes – without independent, public, objectively measurable outcomes produced by us. The methodology is seriously flawed. Human Rights Watch expresses opinions on Sri Lankan war outcomes also. The evidence regarding the internal outcomes during the 2009 war were passed on by Sinhalese soldiers who had positive humanitarian value. Tamil soldiers have failed to demonstrate similar shame about their side. It is when we identify with our own weaknesses that we have recourse to lasting solution. We have the duty to wait until Indigenous Australians reveal the suffering of their community prisoners. It is a human right that we are all entitled to. The entitlement is developed through shared ownership. When I was unjustly sent to prison and was labelled as a mentally ill person – only my immediate family supported me. The Australian Tamil community did not. They probably considered the suffering of refugees to be greater than mine. But to me the Truth is that our pain is relative to our investment in the issue – in this instance our sense of independence/sovereignty. 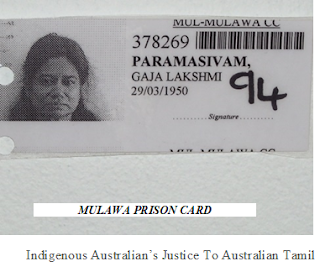 If the suffering of Indigenous Australians is greater than that of the Tamil refugees – then Australian Tamil leaders have the duty to discourage Indigenous Tamils from coming to Australia and not complain when they are sent back to Sri Lanka. Since they do complain – one is entitled to conclude that with all its faults – Australia is a better place for Indigenous communities than Sri Lanka. Human Rights evaluations by outsiders need to be done in a global context – through global principles and not on one to one basis.